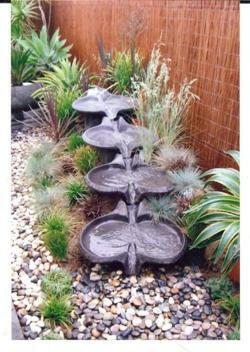 This fountain will create a unique water feature to your garden. Creating a very "natural" sound like a bubbling brook, it flows from bowl to bowl , swerling in a circular motion before it flows down to the next level, repeating the same motion again,as can be seen in the photo's. 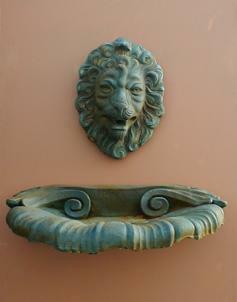 The bowls can be arranged in a variety of ways, limited only by your imagination. From a single bowl, to multipple bowls. We have used three in a straight line, but they can be arranged in a semi circle or weaving like a snake. Each bowl is set slightly higher then the perceeding one and would need to be kept in mind if you plan to place 5 or more in a line. The height differnce in these three bowls is 30 cm from ground level to the base of the 3rd or highest bowl. The flow required is fed from a 3000 lt per hour pump. 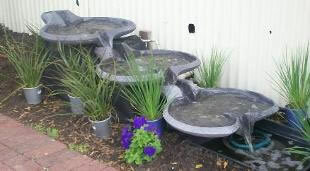 As the bowls hold a fair amount of water, the more bowls used, the larger the water reservoir required at the base. The bowls are approx 60 cm wide and 80cm long. This traditional statue was reproduced from photographs of the original statue in Brussels, Belgium also known as "Manneke pis", where it is a famous landmark, dating back to 1388. The current statue on which our statue is based, dates from 1619. 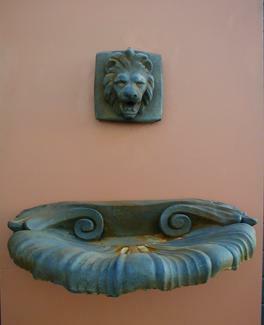 This statue stands about 61cm tall and has a hose connection which will turn it into a quaint water feature. 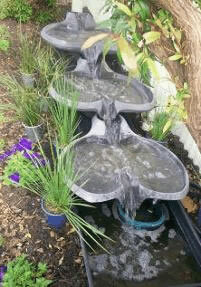 More Water Features will be displayed soon.